Obituary – McNeal, Iona Marie (Highfill) « Perry High School Alumni Association, Inc.
Mrs. Ione McNeal, 36, of 306 Cedar street, died at 5:30 a.m. Tuesday in the Halstead, Kan., hospital, where she was admitted late Monday. Mrs. McNeal became seriously ill Monday afternoon at her home. She was given emergency treatment at Perry Memorial hospital and transferred later in the day by ambulance to Halstead. She had undergone surgery at Halstead earlier this summer. Services will be at 2 p.m. Thursday in Christ Lutheran church with Rev. E. F. Lange, pastor officiating. Burial will be in Grace Hill cemetery under direction of the Newton funeral home. 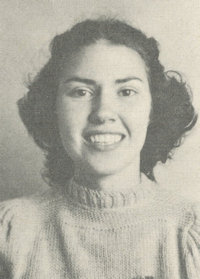 Born Aug. 19, 1927, in Perry, she attended Perry schools and graduated from Perry high school in 1946. She was married Feb. 2, 1948, in Perry, to Jasper McNeal, who survives. She was a member of Christ Lutheran church. Survivors other than her husband of the home include a daughter, Althea, of the home; a son, Mark, of the home; her parents, Mr. and Mrs. Russell Highfill, Perry; and three brothers, Donald Highfill, Lawton; Lowell Highfill, Perry; and Dean Highfill, Oklahoma City.